Home of the annual, world-famous Ironman World Championship Triathlon, Kona is a city on the Big Island of Hawaii in the North Pacific Ocean. Officially known as Kailua Kona, the city invites thousands of tourists year-round to experience the ultimate beach break on this island paradise. Popular attractions include the Volcanoes National Park and Waikoloa Beach. 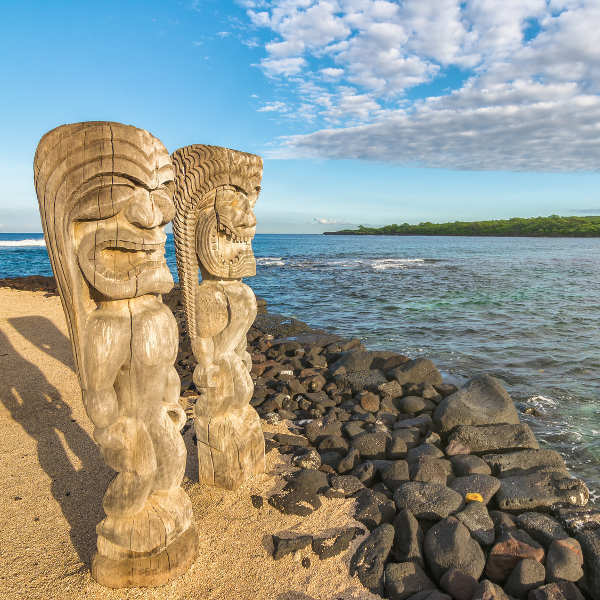 Explore the island’s incredible beaches and native history with cheap flights to Kona! The city is served by Kona International Airport (KOA), which is a 20-minute drive north of the city centre. The clear, turquoise ocean lapping against the dreamy, palm-fringed beaches is what makes this island a holiday paradise. Take long walks along the stretches of white sand, or grab a book and lounge by the water’s edge. Explore the lush jungles on foot, horseback or via zipline. 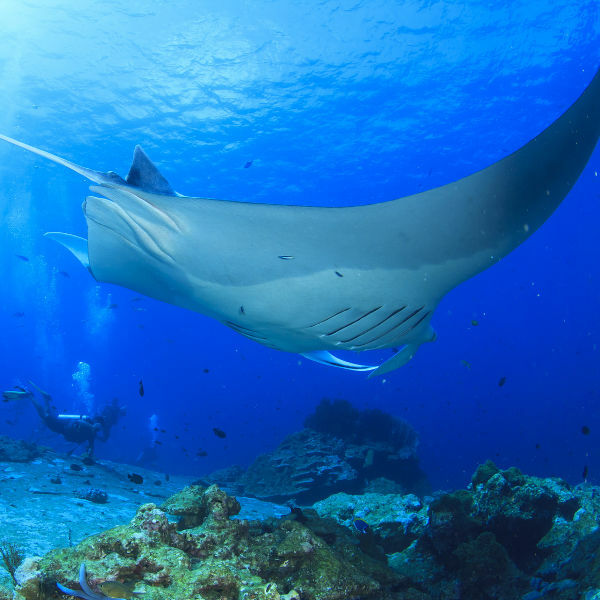 Get up close to seahorses, hike up volcanic mountains and go on incredible manta ray night dives. Whatever is on your bucket-list, Kona has it all! With a history dating back to the 16th century, there is much to discover about Hawaii’s heritage and development. Mingle with the locals and you’ll soon see why this is one of the world’s most favoured holiday destinations. The ideal time to visit this sought-after island is between September and November, when family summer vacation comes to an end. 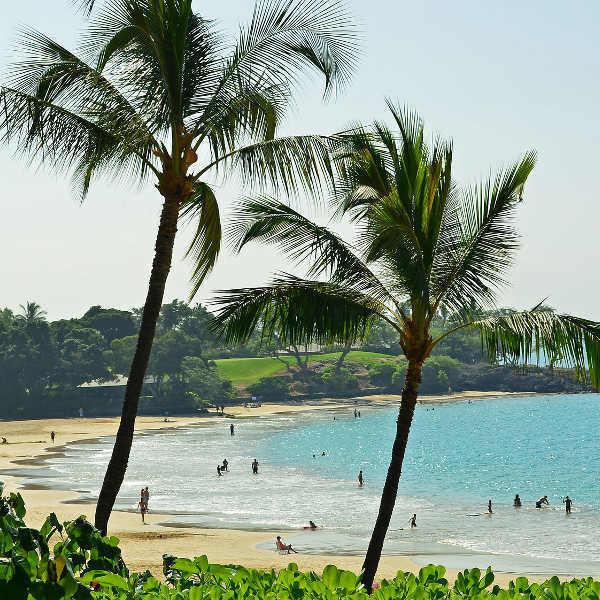 You’ll have the sprawling white beaches, discounted hotel rooms, and the Kona Coffee Cultural Festival all to yourself! If you can take the spring gap between April and May, you can also find some really good accommodation deals – just be sure to avoid a Memorial Day trip, as you’ll be wading through huge crowds. Hawaii’s Big Island should be avoided during its two peak seasons – summer (June-August) and winter (December-March). Although the warm, tropical weather is at its best, you’ll be fighting off American locals for a spot on the crowded beaches, while paying exorbitant hotel rates. Kona’s shimmering beaches, thrilling adventures, and abundance of water sports beckon around every corner. With pristine, buttermilk beaches hugging the coastline, there is no need to venture far for the perfect relaxation spot. Explore the magnificent coastline from Magic Sands Beach - boating trips are frequent. Waikoloa Beach is home to a petroglyph park, which offers a unique glimpse into the island’s history. Aside from the phenomenal scuba diving and snorkelling on offer, visitors can also enjoy hiking and ziplining through the ravines and jungles, take helicopter tours above the hidden waterfalls and volcanoes, or tee off at some of the most prestigious golf courses. Kona isn’t short on culture either. Learn about the island traditions at the Pu'uhonua o Honaunau National Historic Park and see the sacrificial temple of Ahu'ena Heiau. Don’t miss the Historic Kailua Village Walking Tour for a fascinating glimpse into 19th century life in Kona. Experience the local food and culture at a Luau show, and enjoy the free Hula performances around the island. Aside from a must-do coffee tasting, Kona’s Brewpub sports some refreshing local ale. Two hours south-east of Kona you’ll find the Volcanoes National Park, featuring two of the world’s biggest active volcanoes, Mauna Kea and Mauna Loa. On your way out, pick up some of the local java or a few famous chocolate-covered Donkey Balls instead. Compare several airlines, and book your cheap flights to Kona online at Travelstart! Kona is a very safe destination, surrounded by luxurious beach resorts and sapphire waters stretching along its inviting coastline. Due to its popularity as a tourist destination, visitors are urged to practise common sense and safety precautions, particularly outside of resort areas. Do not leave valuables unattended, and women are advised not to leave handbags on the backs of chairs in restaurants. Ensure you wear plenty of sunscreen and a sunhat when lounging on the beach.